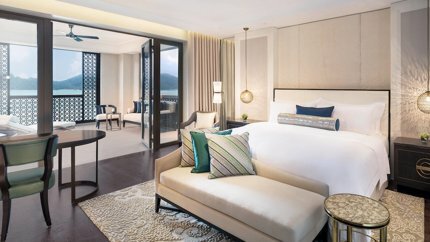 This is Marriott group's latest luxury creation in the island. The resort is located close to Westin Resort and at the southern tip of the island overlooking the Andaman sea. Across the southern tip of the property is a narrow channel known as Straits of Malacca. This is the water passage used by ferries plying between Kuah Jetty and Kuala Perlis as well as Satun of Thailand. The super luxurious property has grand eye-catching pillars, swathing marbles, wonderful gardens, rooms with ceiling to floor windows offering sweeping views of the ocean or pools & tropical gardens, and all these combined with unmatched services. There is also a private white sandy beach, although the water here can be murky during the tides and may not offer the best of swimming experience. There are 85 suites with ocean or pool views spread across 6 floors. And there are four waterfront luxurious villas each having its own pool. While all rooms and villas have top notch amenities with classic-modern looks as you would expect in a 5-star Marriot hotel, the box shaped villas create a little eyesore on the coast line although the interiors adequately make up for this. Rooms have dark wood floors, a little subdued decor although elegant with a touch of gold, ivory and sea green. Balconies in the suites are special. From the ocean view rooms you get wonderful view of sunrise. And what more, you can enjoy a personal butter service in this resort which is by far the best in the whole of Malaysia. The bathrooms are huge, have double vanity other than a bathtub with separate shower. 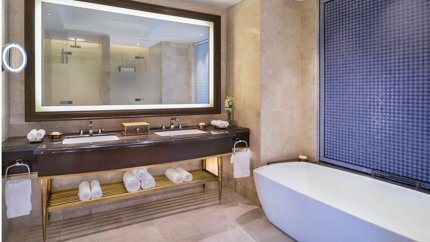 All rooms in St. Regis are non smoking, spotlessly clean and insect free. Wi-fi is complimentary and so is a bottle of water. Other amenities include king size bed, coffee/tea maker, mini-bar, sofa, writing desk with chair, dryer in the bathroom, slippers, safe (at an extra cost), etc etc. The entire indoor of the property is air conditioned. Although you can use the room service and enjoy your breakfast at your private balcony, the buffet breakfast spread at the main restaurant L'Orangerie is excellent and innovative. This huge restaurant is set up in a backdrop of rainforest and serves breakfast, lunch and dinner. The restaurant Kayu Puti has both inside dining as well an over-water terrace. It specializes in Aisian fusion cuisine and serves dinner and cocktails. Pantai Grill is their latest addition and has a rustic decor. It has a tropical surrounding and serves excellent woodfire grilled seafood and steaks. The steaks here are arguably the best you can get in the island. It's open for lunch and dinner. The bar serves great spirits and cocktails. However the wine selections could be better. The service at St. Regis sets a very high standard in hospitality sector... it's top notch, friendly and extremely caring. Right from your check in (when they serve you the traditional St. Regis iced tea and Malay cakes) and until your check out, you will always feel you are at the hands of the best. In fact the Managing Director of the hotel herself makes it a point that she meets the guests whenever she can and finds out whatever they might be requiring. They also offer you BMW pick up and drop. Continuing on the subject of service, even the beach service is excellent. There will be someone all the time coming to you with a bottle of water, fresh towels and assorted fruit skewers as refreshments. Although the white powdery beach is great, the often murky water and the silty sea floor below are not exactly great for swimming. The hotel management has been trying hard to rectify this problem, but it's not in their hands completely. One of the highlights of the hotel is its Iridium Spa with its soothing darkish decor and water falling over the wall. It offers a vast range of massages, therapies and treatments other than facials, wraps, manicure/pedicure etc. Therapists here are some of the best you can find in Malaysia. The resort also has an Infinity pool, children's pool and a whirlpool, as well as a fitness center (The St. Regis Athletic Club). Car parking, mobility accessible rooms, front-desk safe deposit boxes, barber, concierge are some of the other amenities. Check in is at 3pm and check out at 12. The hotel is located at the southern tip of the island near Kuah town and about 20-minute drive from the airport. The hotel provides pick up and drop services.